Here is another top I did a few weeks ago using Simplicity 2657. I made the back piece a lot longer width wise so I could just shirr it and not have to add a zipper or anything. Easy to slip on and off. Love, love,love it! The refashioned fabrics are great and I especially like the criss cross top. awe, you look amazing jessica! great top, love love it! That is super cute!!! Gotta say I’m completely jealous. I can’t sew clothes to save my life. But all yours look incredible! Super cute. I love the shirring idea, too. I have a top that I just put together on a whim the other day and didn’t put a zipper or hook closure on it and it is like squeezing into a sausage. I love the idea of the shirring instead and it would make sewing it up so much easier. Fun. Oh how CUTE!!! 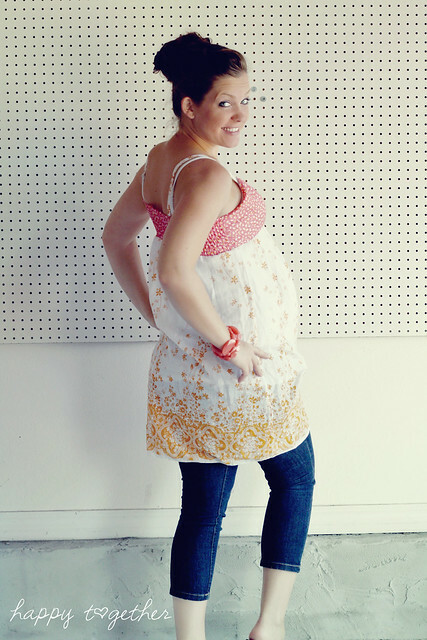 I recently found your blog, and was so grateful for trendy mama, and belly beautiful ideas. 6.5mo along on #1, and excited to sew for this little nugget too 🙂 Thanks for the hope!